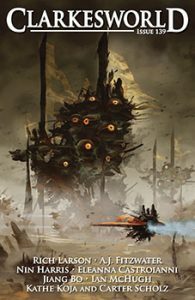 An excellent SF short story from a Galaxy Award nominee and former editor of Science Fiction World, “Deep Sea Fish” first appeared in the original Chinese in New Science Fiction and subsequently became anthologized in China’s Best Science Fiction Stories of 2011. The plot involves an archaeologist named Yanse who travels to Titan in 2065 to document the glyphed ruins of an ~20,000-year-old alien civilization, before colonists destroy these monuments through the process of terraforming Saturn’s moon for broader human habitation. His guide while there is Izzy, a native-born Titan colonist who philosophically disagrees with the terraforming plans. While Izzy helps Yanse race against time and environmental threats to ‘save’ as much of the vanished alien culture as possible, Yanse begins to see the value and power in Izzy’s point of view. Hui’s tale is vivid, writing with descriptions that almost cinematically open to the reader’s senses. She peppers the plot with a great deal of scientific details regarding Titan’s environment and its differences from Earth. This is done in a matter-of-fact style that isn’t always well-integrated with the emotions of the story, though this may be a result of Bies’ preference to translate with fidelity from the Chinese rather than adapt artistic conjecture. However, the scientific detail Hui provides vanishes once speculative application becomes required. We are told precisely how Titan is, but just generally reassured that the colonists have a particular technology to help them manage despite the conditions. The speculation of Hui’s story comes more on the side of cultural, as an exploration of the limitations of human biology and what consequences they hold for our drive to explore and settle extra-terrestrially. Hui does not merely criticize the human desire to alter environments to better suit our comfort, nor does she provide a pessimistic perspective of the environment defeating us. “Deep Sea Fish” points toward directions of recognition and compromise. I highly recommend this one. A piece of translated flash fiction available on the publisher’s website as part of their dystopia themed Fri-SciFi series, Campo’s story is like a Twilight Zone snippet: A scene that establishes familiarity yet seems slightly off, with a conclusion whose implications surprise, even shock. “Fifth: You Shall Not Waste” provides a quick glance into a near-future world ‘marked by resource drain’ where the mistakes of the past have led to cultural dominance of rationality. For a moment one wonders if this is a humanity that has gone the route of the Vulcans of Star Trek, banishing emotion for choices borne of pure logic. No, not quite. The story makes you consider how far rationality may extend, if there are perhaps rational choices can compile together, misapplied into an irrational end. On a simple level Campo’s story is a bit of clever entertainment. Beneath there is also more. Chinese astronaut Jiang Xiaoyu and American astronaut Maxwell Davis are working in space as part of an international cooperation between their nations when a ship appears from out of nowhere. Moving past them in near-invisibility, its presence betrayed only by the starlight it blocks out, the massive craft represents the moment of first contact for Earth, a monumental event long speculated, but suddenly dropped upon humanity in a flash of surprise and panic. As Xiaoyu and Max scatter to return to station, Heavenly Palace Seven, and learn more about the vessel, Chinese officials on Earth rush to determine the alien craft’s intent and make peaceful contact as humanity’s first representatives. But the Chinese have sunk their efforts into development of a large structure, The Wings of Earth, designed to collect solar energy, while the Americans have built the more advanced ships that could reach the alien craft first. The race thus begins to both contact and understand the enigmatic craft and its presumed pilots, an opportunity that soon falls to Xiaoyu and Max. Novellas are not my favorite. Filled with scenes and details too long for a quick read, yet not given enough space to explore as a novel, they appear to me as bloated stories that lose the minimal perfection of a short work, while simultaneously introducing a larger world that never adequately develops as it could if longer. I definitely had this reaction to “The Wings of Earth.” It begins strongly with an excellent amalgam of characterization and establishment of the science, with a vibrant cinematic tone. But things slow when the action switches to Earth, away from Xiaoyu and Max, in scenes that I felt were unnecessary filler. Yet, though I would have preferred the story shorter with sole focus on the two astronauts, I still enjoyed Jiang’s story as translated by Dudak and the themes/questions it featured. I am a sucker for first contact stories and enjoy discovering an author’s speculation as to what alien life might be like and how we as distinct intelligent species could or could not communicate with one another. What I particularly liked about “The Wings of Earth” is Jiang’s take on a future China and America, engaged in a friendly rivalry, and determined to handle first contact in an optimistic manner. Neither astronauts or officials give in to panic from the surprise visit and potential threat of the alien craft. They proceed cautiously, speculate on potential dangers, but they don’t react foolishly. This behavior corresponds to a general theme in the story around the benefits of building for the future, not just immediate action, while also acknowledging the risks that this might bring. Before I even get to the story, a note about Asymptote Journal: it is wonderful to see a work of translation with complete accompanying material. Readers get a bio for the author and the translator, as well as statement of context from the translator. Even more there is artwork, a recording of the author reading the story in Korean, as well as a link to the original Korean text. When I’ve had translations of French works to review I always find it bittersweet, because I can’t really comment on the translation without having the original text, which isn’t always easily (or affordably) obtainable. Given Asymptote’s mission in world literature translation, their attention to detail and credit is perhaps not surprising, but still bears mention and gratitude. 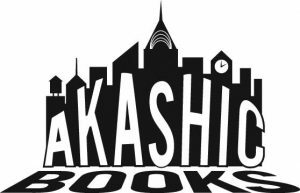 “Taklamakan Misdelivery” is excerpted from a novel of connected stories by Bae that share their setting in Beanstalk Tower, a ‘674-story skyscraper that functions as a sovereign state’. Superficially reminiscent of J.G. Ballard’s novel High-Rise, Bae’s universe shares with it considerations on the politics of power and the actions of the individual. But here the conceit is less surreal, yet more unrealistic. It is hard to accept how a building could offer adequate space for a nation’s activities – no matter how tall. Nonetheless, realism also isn’t really the point here, it is the effect this artificial setting has on its characters and the choices they make. Years ago Eunsoo and Minso were in a relationship, but their drifting apart became secured with Eunsoo’s decision to accept a position in Beanstalk Tower. Afterward Minso wrote a letter to Eunsoo that never was properly delivered, due to the nature of Beanstalk’s mail systems. After a long period of indecision, the man who found the letter, Byungsoo, finally delivers it to Eunsoo. But Byungsoo has looked into the author of the years-old letter, and also bears news of Minso’s current status: recently shot down and lost somewhere in the Taklamakan Desert of China while on a mission as part of Beanstalk’s military, which he has joined in the hopes of immigration. Bae relates this story and its consequences through a narrative flow that alternates between the past and present of all three characters. Somehow Bae does this while keeping everything engaging and comprehensible. Much of the background on the workings of this Beanstalk Tower universe appears in an awkward info-dump type manner, but the strengths of the characters and story’s mature take on balances of individualism and collectivism make up for shortcomings. 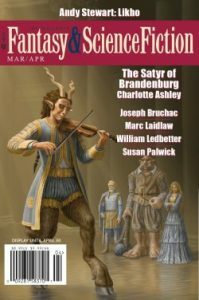 This is the second SF genre selection from a special Korean section of this spring’s Asymptote, an issue with at least eight other translations that fall outside speculative fiction, but that are still worth checking out. “Lunchtime. A simple meal. A Starbucks Espresso. That was all. A mundane Seoul lunch and a routine trip to the café are broken by the sudden arrival of a UFO in the skies above. Only it’s not a UFO exactly. It’s a thing. It’s something. The world goes abuzz in the mystery, but in the absence of immediate danger, daily life goes on. I’ll leave it to your reading to discover how the title of this story relates to all of this, but suffice it to say it involves a dose of surreal and pitch-perfect humor. Both difficult to translate, both Park and Joseph make such an endeavor successful through the textual construction. “Aspirin” ultimately seems like a reflection on the comforts that we find in the routine and the question of what sort of large-scale stimuli are necessary to get ordinary individuals to react, particularly when one struggles to define what is going on within one’s framework of reality and culture. I’m ready to read more of Park wherever I can. 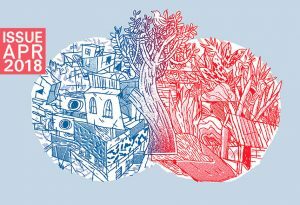 This story is an example of how valuable and necessary translations of world literature are.